Despite some seriously killer humidity, I did in fact get to have a great lesson this week! We took lots of walk breaks, left the ring a couple times to catch a breeze, and drank lots of water, but we also worked pretty hard. Our flat warmup was fairly basic- one fun exercise we did was standing straight up in our stirrups, bridging the reins in one hand, and then reaching our free hand all over the place (up in the air, touching toes, doing the backstroke, etc.). Throwback to pony camp, anyone? I’m definitely getting better at keeping my balance when we do this! Lots of extending-collecting transitions at the trot and canter as well. Despite the heat, Beastly was raring to go and very eagerly carried me into the lengthenings. Our collection is slowly improving, but she still very much prefers to stretch out and run around. First up was the outside vertical to outside vertical, then down the diagonal line in a flowing 3. Everyone else had to leg up for that three (or put in 4), so you can safely assume that it was a slightly woahing 3 for us. After doing that, we went through again and added the diagonal oxer. Next, we did 1-2 the other direction (clockwise), up the oxer, down the green outside, and up the stone wall (3). The other girls managed to pull some super impressive inside turns but I was trying to get a better balance through the corners without the Unicorn leaning on my hands as much- we took the long way around. Then the jumps went up! Most were likely 2’9″-3’ish, but I swear that outside green vertical must’ve been closer to 3’3″. I’m a notoriously bad judge of jump height, but that definitely looked more sizable than our usual fare. And then because I’m a weenie, I got tense. So Beastly got tense. And then I braced. Which made Beastly tense more. Which led to a whole lot of sloppiness. Trainer’s comment when faced with us snorting and prancing and galloping around the ring? Welp. Officially been called out by my trainer. So we went and tried it again, with one goal: breathe and soften. Lo and behold, as soon as I relaxed and let My Little Pony do her job, she gave me SUCH a softer ride! Certainly not perfect- we still got fast and unbalanced at times- but she was so much more responsive and definitely seemed happier. The revelation that better riding leads to better rides never fails to blow my mind. Trainer mentioned that for such an opinionated horse, it’s interesting that we can “catch more flies with honey” with Addy. I can get in a fight with her all day long, but she’s much happier and willing to please if she knows we’re on the same side. You. Do. Not. Mess. With. Us. Getting closer and closer to HITS! I can’t wait to share this experience with my girl, and then report back to all you awesome people! PS- It’s my INCREDIBLE father’s birthday!!!!! He’s the most supportive, interesting, entertaining, intelligent, loving, and all-around fantastic person I’ve ever had the privilege of being loved by (well, tied with my mom of course). Please join me in sending happy vibes his way today! Addy LOVES getting her face brushed. When she sees me coming with a brush, she sticks her nose out and puts her head down and snuffles into my face while she gets her face scratches. I know I’m not alone in coveting new gear for myself and my pony, right? For those of you shaking your heads, take a good long look at yourselves and be honest. I know you want pretty things. That’s right. I’m calling you out. Myself, I’m an unabashed clothes hound. I used to covet dresses and pretty blouses, but that hoarding tendency has transferred 100% to horse gear. Since I’m half-leasing for the time being and much of Addy’s gear is taken care of, this tends to manifest in lots of riding clothes. And that’s where SmartPak comes in. I could write an ode to their fast shipping, fantastic return policy, or lovely selection that amuses me on their website for hours on end. But that’s not what this post is about. Instead, I’ll share my latest haul(s) and tell you exactly what I think: the good, the bad, and the ugly. I got these in the merlot-charcoal color based on an emphatic recommendation from Jenn at Stories From the Saddle, and haven’t regretted it for a minute. I also got another pair in iron-champagne thanks to Allison from Pony’tude, and am eying a couple other color combos on the website. The good: so super comfortable. The sock bottom make them fit really well under my super tight tall boots, and the material has just enough stretch to make them great for all-day wear without getting baggy after a few hours. I’m also a huge fan of the colors- the merlot is straight up pretty and a fun different color, and the iron is perfect for hiding dirt without looking like you’re trying to hide dirt. You know, that effortless barn chic we all crave (sadly it looks like this color is discontinued. I’ll try not to gloat too much). Basically, I feel like a fashionable rockstar in these; everyone looks better with a little euroseat stitching to give some shape. The bad: the waistband is a bit gappy. I don’t have much of a badonkadonk so this isn’t too bad, but my friend had to return hers because the gapping was so extreme. I just throw a belt on and it fixes the problem for me. For the price ($70ish but there’s regular 20% off sales!! ), I ain’t too mad about this. 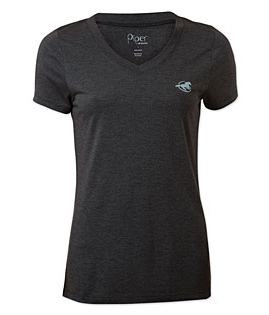 I recently snagged three of these on sale in black/gray, blue jean, and coral pink. In fact, I wore the blue jean tee yesterday and currently have the black/gray tee on. The good: literally everything. They’re way softer than anticipated, fit nice and close to my body, have just enough of a vee-neck to be flattering, they’re long enough to tuck into low-rise breeches, and the colors are great. 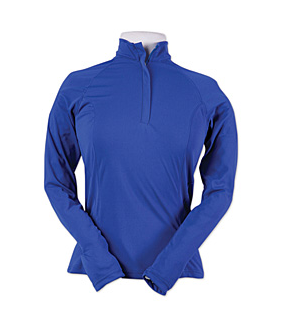 Not to mention the price- with the sale and my USEF discount, I paid roughly $7 per shirt. 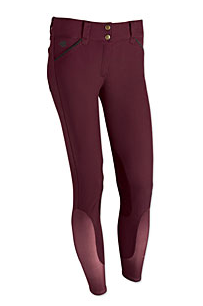 The black/gray also perfectly matches the piping on my merlot Piper breeches, so I’m psyched to be the matching queen. The bad: I didn’t buy more while the sale was on. Seriously, I can’t think of anything wrong with these. I guess my coworkers sometimes ask why there’s a horse on my shirt (the Smartpak logo)??? But that’s their problem if they haven’t realized I’m a crazy horse lady, so I refuse to ding the shirt for that. Picked this up (also on sale) in the royal blue color based on strong recommendations from Jenn (there is a pattern here. She is my enabler). The good: in love with the color. Especially with my snowy white pony (listen, I can dream about her someday being clean, don’t burst my bubble). It’s fairly lightweight and I don’t get too overheated in it. The bad: While it does protect me from the sun, I definitely know that I’m wearing a long sleeve shirt in the middle of July. It’s much better than another long sleeve would be, but the breathability isn’t as high as I was hoping. Also, the sizing isn’t great- I got an XS and it’s still super boxy. I’m showing in the jumpers more often, so we need to have a bonnet. Right? I’m a big fan of playing dress up so we’ll go with it. I lucked out that my barn colors were available (navy and burgundy) and the price was right, so I pulled the trigger and ordered. The good: the ears fit really nicely and it’s a good size overall. There’s plenty of material to go under the crownpiece, so I never worry about it getting loose. Like I said, the colors were ideal. The materials were good too- Lycra ears which stretched just right and cotton woven front. The bad: maybe I’m just bad at bonnets, but I couldn’t get this to lay flat and pretty. Part of this may be due to Addy’s big poofy forelock that I didn’t adequately tame prior to our ride, but it just didn’t seem quite right. I’d be curious to see how other bonnets fit to see if this is something wonky with the bonnet, or something wonky with Addy’s giant head. 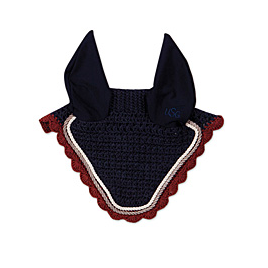 Got this in navy to wear to our first jumper show- I really lucked out that my barn’s colors are navy and burgundy, since most things come in navy and it’s my favorite color. Boom. The good: nice weight, has held up really well in the wash, and definitely long enough to tuck into low-rise breeches. 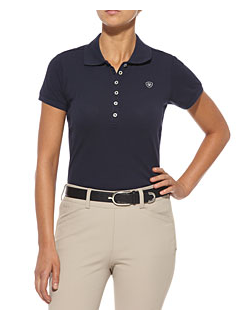 It’s a pretty navy and I like that it has 4 buttons instead of the classic 3. I now have an official barn polo that I’ll likely wear in shows, but I love wearing this in lessons and for schooling- it looks very sharp and professional. The bad: SO HOT. I know a medium-weight dark polo probably wasn’t the best choice for a hot summer show, but I was sweating like a pig in this thing. It’s not the shirt’s fault for that though, it can’t help the way it was made. I also wish it was a little cheaper, but I’m the type of person who hates paying more than $10 for a shirt (but apparently I’m fine with dropping $200 on pants without blinking). For the quality and comfort, it really is a very fair price. We’re gonna keep rolling with the lesson reviews, because I keep rolling with the lessons. And folks, this was a good one. Before I get into the nitty gritty, I want to give huge props to my esteemed Daddoo, who very patiently and enthusiastically listens to me minutely describe every stride of every lesson, which helps me organize my thoughts before blogging. Without my dear father, these recaps would not be what they are and I would be lost in a sea of sadness. Dramatic? Maybe. I get it from my Dad. Anywho, last night we had a lesson with my awesome Assistant Trainer (I’ve sung her praises in past posts and will continue to do so here). Not only is she a genuinely cool person in real life, but she has such a knack for coaching. 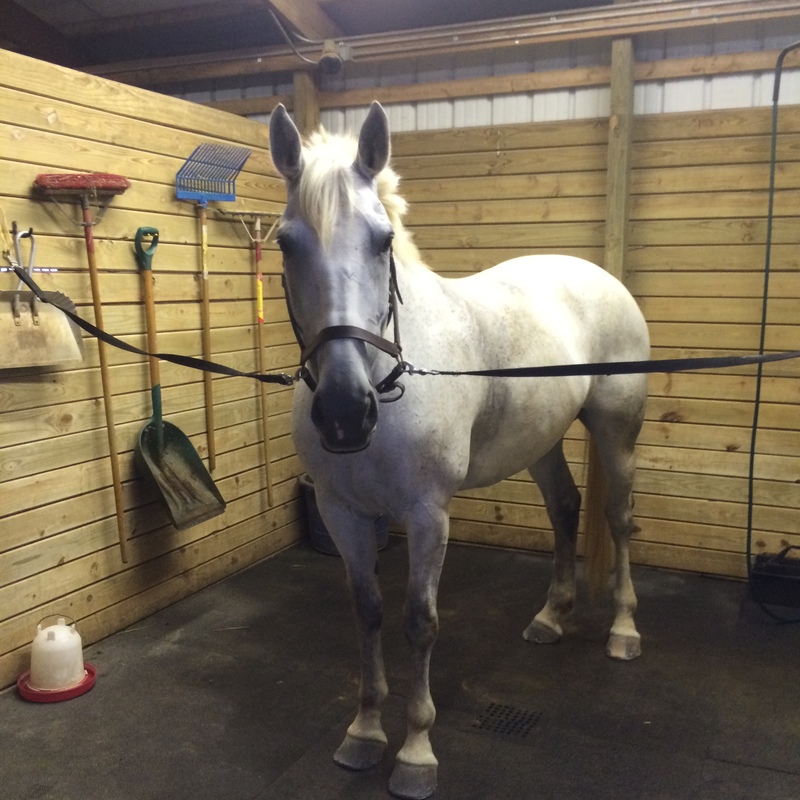 We spent a looong time on our flatwork last night with a focus on suppleness and control. 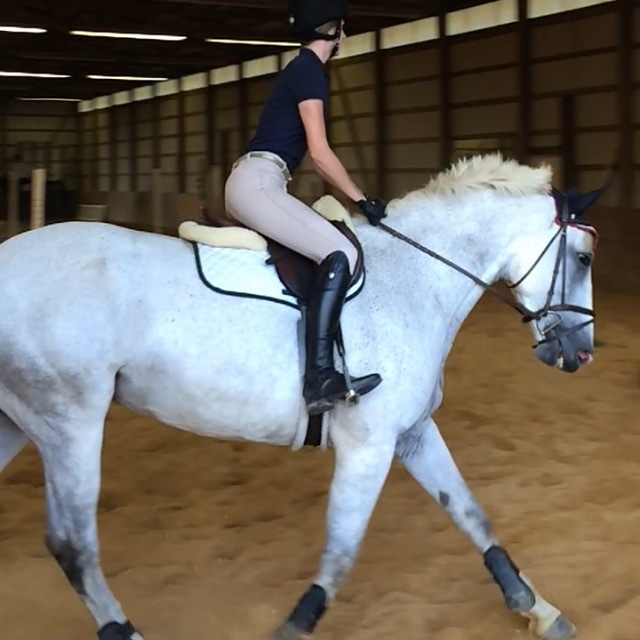 We did a lot of transitions from counter-bend to correct bend at the trot, large circles to small circles, serpentines, changing directions, and maintaining the power in the sitting trot. Beastly was a little behind my leg at some points and I had to leg her up, but she responded reeeeally well to the counter-bending exercises we did; she was much softer and willing to be led once we loosened up like that. AT wanted us focusing hard on using our outside aids- she said that we want to set the track and bend using our inside leg and hand, but the outside aids need to be present and strong to maintain the balance and create a place for the horse to move into. She was constantly reminding us to keep that feel on the outside rein no matter what we were doing. Moving up into canter work, we did a fun exercise where we changed seats. After establishing a comfortable working canter she had us stand in our stirrups for a while- focusing on getting our heels far down and keeping our leg stable- then drop a little bit into a half seat- where we moved our hands low and wide so we couldn’t rely on them for balance and instead had to engage our cores- and then drop further into a more upright and deep “equitation” seat- keeping our legs long and engaged, and our shoulders back. In all of this there was a focus on straightness- we wanted a gentle bend around the corners but we wanted a perfectly straight track down the long side. She also emphasized keeping our leg on, and said that collecting in a gait takes 100x more leg than extending should because you have to be there to support that collection. Our first exercise was to trot in to B, turn right and halt in front of E. Getting a halt after a jump is a pretty Herculean effort on Beastly. so AT showed us that instead of just bracing in the stirrups and waterskiing, she wanted me to sit deep, engage my core, and keep my leg on to support that halt. We definitely halted closer to the wall than I wanted, but AT was much happier with our second attempt! She reminded me that on a horse like Addy who tends to get rolling, I have to commit early to any changes in pace so that I have plenty of time to achieve them. Our next exercise was the bending line from D to E. This was set so that if we came in conservatively and bowed the track it could be a four stride, or a more direct three stride. Hmmm, I wonder what we got?? I was able to get super conservative in with a nice small bouncy canter, but wasn’t able to recover fast enough to get the small strides again for the four. At one point I had set the Unicorn up for a really nice short distance in out of a small canter and she ducked out- AT told me that I had made the right move and that was definitely the right decision, Addy just didn’t want to do it because it was hard. We circled around and made Addy put in the effort from the base. 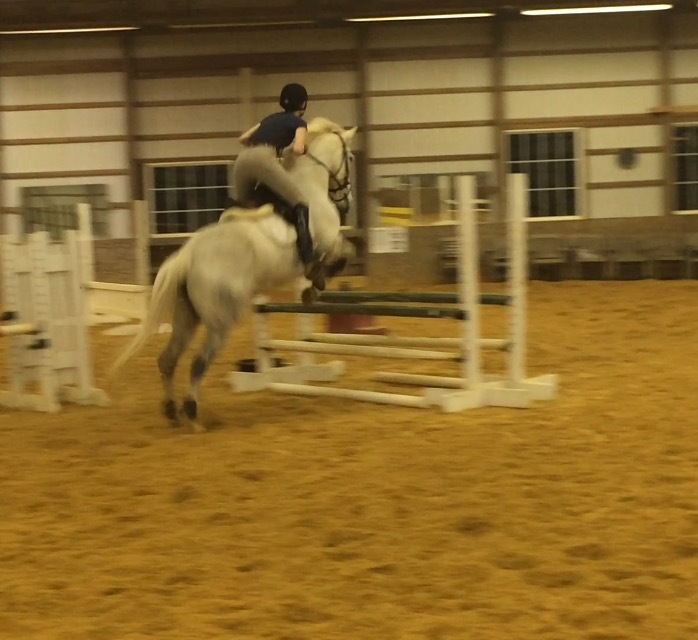 This jump was like 2′ tall, she had no excuse not to. Next! We went up the diagonal at F and hard right turn to roll back over G on the wall. I was pretty nervous because this closely resembled the Turn of Doom we had such trouble with a while ago, but determined to leg on and make it happen. Our first attempt wasn’t exactly pretty, but we did make it happen! The next time through AT had me slice the jump a little from right-to-left to create more of a space to turn in, sit super deep in the saddle, and use my outside leg HARD to get that turn. And we did it! After working on all of these things individually, we pieced it together into the following course: A-B-C-D-E-F-G. Canter up the outside crossrail, down the in of the outside line, turn right to come over the plank, down the bending line, up the diagonal stone and rollback over the red out. This rode really great! We got a little gappy to the crossrail which was totally unnecessary, but got nice and quiet to the black vertical. We could’ve used our space better in the rollback to the quarter line, but this worked out well regardless. The bending line was our best yet- a liiiittle bit more and I think we could’ve fit the four in. The rollback went beautifully- I even cantered in to the diagonal jump and we STILL got the turn without too much fuss (AT had let me trot in before to guarantee a quieter in). This was such a cool lesson because it was really focused on the basics. 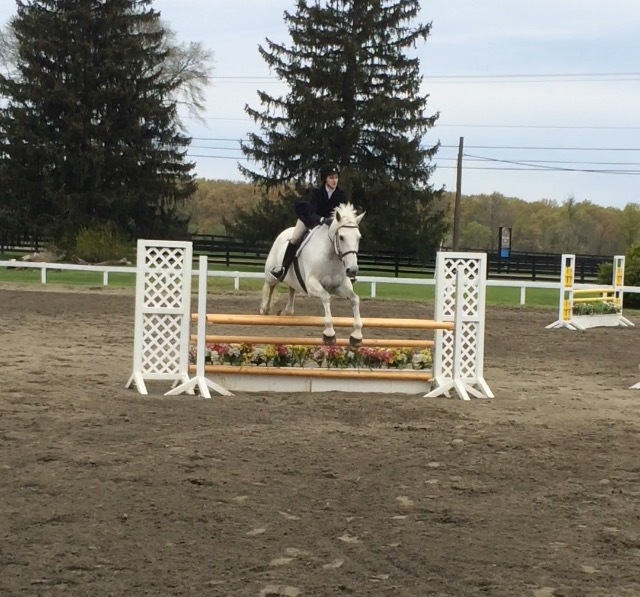 None of the jumps were higher than 2’3″ (I’d be surprised if they were even that big) but the exercises we were doing were intended to make our horses more rideable. We worked on our equitation and giving our horses the support they need on the flat and over fences, and we built up our course bit by bit so we could master each section. I was definitely exhausted both mentally and physically after this lesson! AT had a really good point- we want to get Addy “rideable” enough so that we don’t have to put the Pelham in when we jump. She is not a professional’s horse, she is an amateur’s horse. Her owner did not buy her to go win the Modified Adults at A shows, she got her because she enjoys riding her. 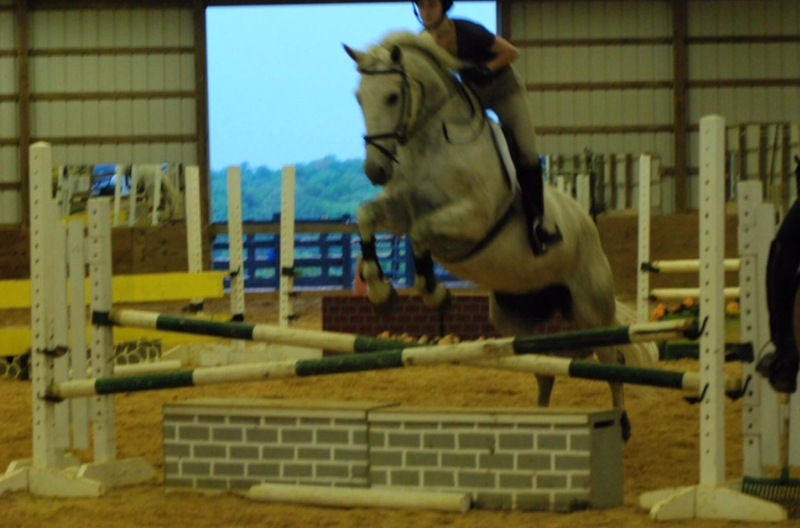 My goal should be to get her relaxed and comfortable with jumping instead of hot and excited. The short version: counter bending and bending, changing seats, leg on, master each piece of the course. Basically, be a better rider. What basics have you been working on lately? Olivia, you ride a strong horse. Since the Beast has been making a habit of dragging me around over fences in our last couple lessons, I decided to pop the Pelham in for our lesson yesterday. Ain’t no way I was dealing with that crap any more. We had a nice warmup WTC, lots of no stirrup work (ow) and lots of work on extending and collecting our canters. I focused on sitting deep in my saddle and squeezing her up into the bridle to attempt to get her to soften into the collection. Definitely a work in progress, but being able to engage that curb rein when she got strong helped a lot. I also made a point of making Addy wait until I gave her the cue to canter. Picking up my reins, changing direction, going around a corner: none of these are cues to canter. She’s gotten much better at waiting instead of anticipating, so I’m going to have to stay consistent with that. Our first was: A-B-C-D-E. Up the stone wall, down the other stone wall/oxer, up the quarter line, and down the oxer. Lots of long approaches! I was pretty happy with this- Beastly got a little strong in places and took some flyers, but overall was fairly responsive. The quarter line was set to a long 3/short 4, so I just let her open her stride a bit more and carry me for the 3. We played around with different combos of that for a while, and then gave this course a try: H-F-G-B-C-D-G-B-A. Pink outside vertical towards home, up the outside line in 4, down the stone wall, up the quarter line, down the outside line in 4, up the other stone wall. Honestly I’m 99% sure we had another course in there somewhere but I already forget so we’ll focus on this. Our first attempt at the first jump was a launcher from downtown because Unicorn got super psyched about it, so we came around and started again. She still got psyched, but we got to a much more reasonable distance. We had to hold a bit going up the outside line because it was set for a short-ish 4, but it wasn’t so bad going away from home. We got nice and close coming down the stone wall, made a nice turn to the quarter line, and recovered our canter nicely around the short end coming to the outside line. This was really tough to fit the 4 in because we were heading towards home, and took a couple tries for me to get it without resorting to the pulley rein, but we got there. Then we got nice and close to the base going up the other stone wall too. Phew! Overall, I was super happy with this course. It definitely had some sticky moments, but I felt like I was calling the shots instead of climbing up Addy’s neck and hoping she wouldn’t take a flyer. 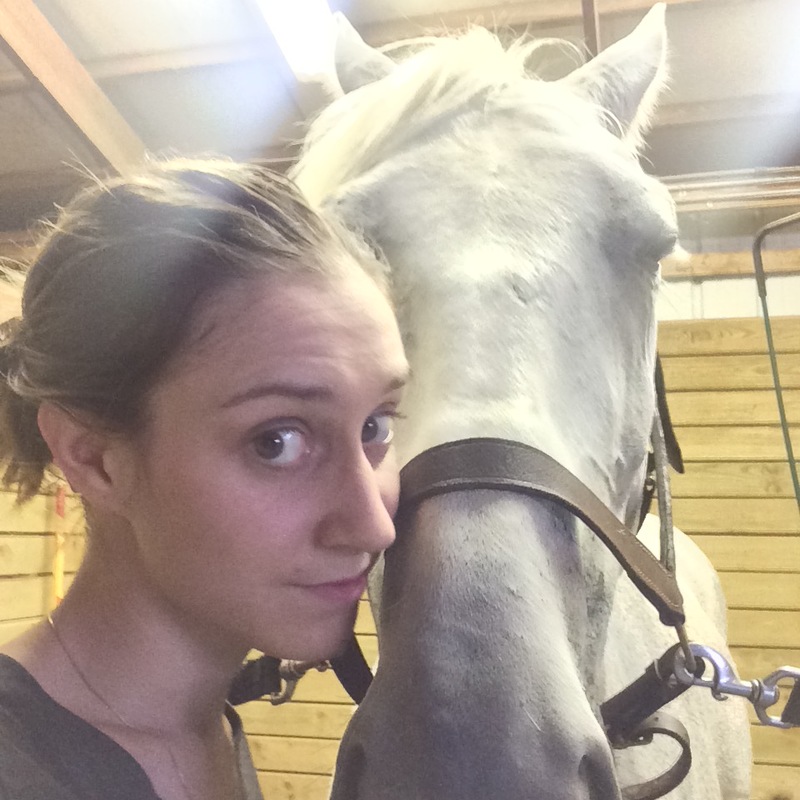 I’ve been really bad about tipping my upper body forward and getting light in the saddle lately. This works in the hunters. This works for lots of horses. This does NOT work on a big ol’ draft cross who gets REALLY excited about jumping. I made a point to sit up, sit deep, keep my leg on, and close my hand to make her wait to the base. Thrusting my hips a little forward and using my core as an anchor made a world of difference in getting Addy’s attention: I finally felt like she was cantering under me and ready to go where I asked instead of carrying me around and occasionally checking to see if I was doin’ OK up there. My trainer seemed happy with how I rode this too- she liked the quality of our canter between jumps, and was super happy that we waited to the base instead of leaving the stride out. That’s exactly what we want for the jumpers! Pretty Girl has a huge step, so I never want to be that team galloping around trying to make time. We don’t need to do that. If I can get Beastly packaged up under me, we can be efficient with our turns and careful with our jumps. The time will take care of itself if I give my girl a good ride. 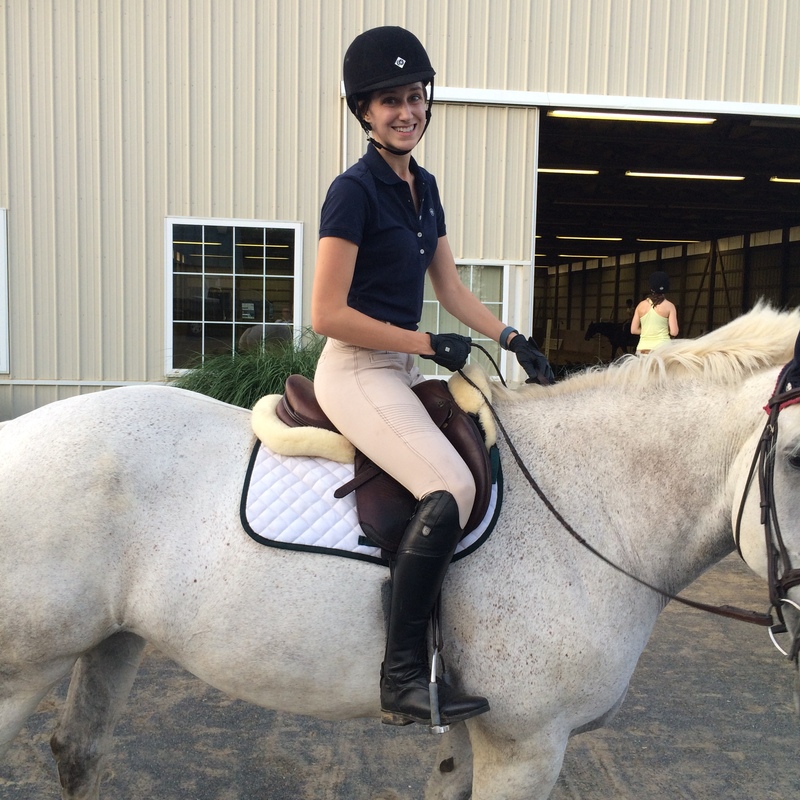 It was also pretty gratifying because my trainer said to me, “Olivia, you ride a STRONG horse. She will drag you around if you let her. You didn’t let her in that course, and even though it wasn’t perfect, you made the best decisions you could make based on what you had to work with.” I’m still cheesin’ about that one. Addy definitely has been challenging me a lot lately, but I’m so excited that I’ve been able to keep up and continue progressing. I definitely feel like a much stronger rider than I was a couple months ago. 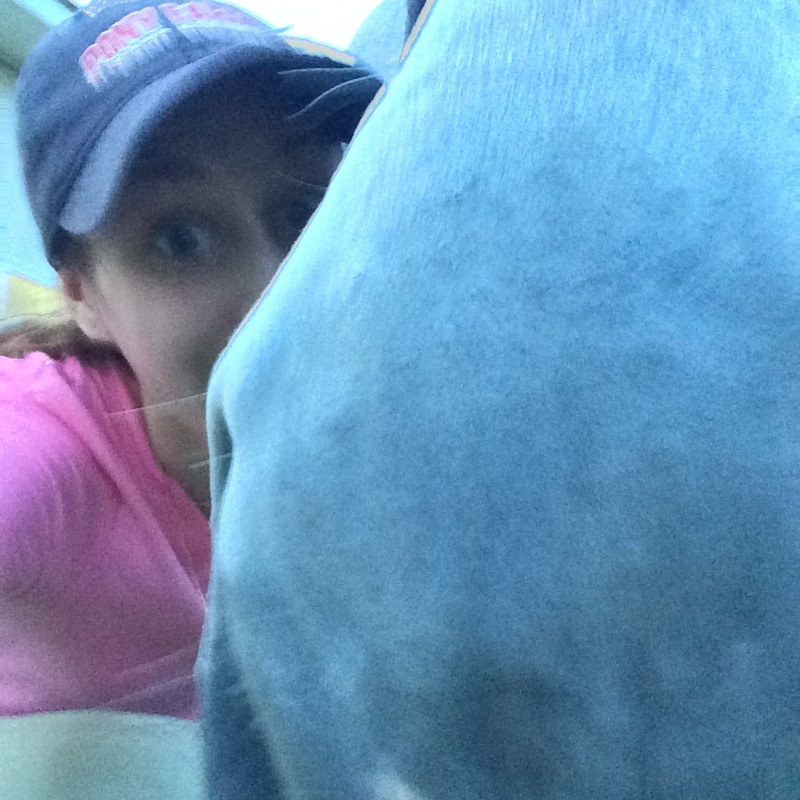 In other exciting news, Beastly and I are going to our first ever rated show!! I’m pretty sure it’ll be her first ever rated show, and my first in roughly 10 years. We’ll be trailering in to HITS Culpeper for one day and doing two jumper classes- level 0 and level 1 (0.8m and 0.9m). I was a little disappointed because I so badly wanted to do the Low Adults (1m) but Trainer made a very good point- this is Addy’s first rated show, and we want to create a good experience for her and not overwhelm her. Does she have the scope for 1m? Absolutely. But there’s going to be so much going on, we’d rather keep the jumps a little lower and have this be a confidence booster for her. We have all the time in the world to move up. I’m glad my trainer reminded me of this, because my tendency is to kinda rush into things. It’s hard to remember that my pretty pony is VERY green when it comes to shows! Anyways, I’d love any advice that y’all have for surviving the jumper ring at HITS. In even MORE exciting news, I have a brand new pair of Pipers thanks to Allison from Pony’tude!!! They’re in such a cool (discontinued) color and I’m always thrilled to add to my collection. I’ve got a big Smartpak post coming up soon where I talk about all the gear I’ve gotten recently, so keep an eye out for that! I’ve got another lesson this afternoon, so get pumped for yet another lesson recap tomorrow. Get into it. It’ll be awesome. Addy has the sweetest little heart right on her forehead that only shows up when she’s clipped or completely soaked. This mare is legit made of love. Nicole, you are a genius. I’m loving everyone’s oops moments! God knows we all have plenty, amirite?? Without further ado, here’s the best fail pics I could come up with. I may be a teensy bit vain and only keep the pictures I look nice in, so enjoy my cobbled together collection of screenshots. Or the time we took a flyer and I signed a lease on Addy’s neck because I live there now. 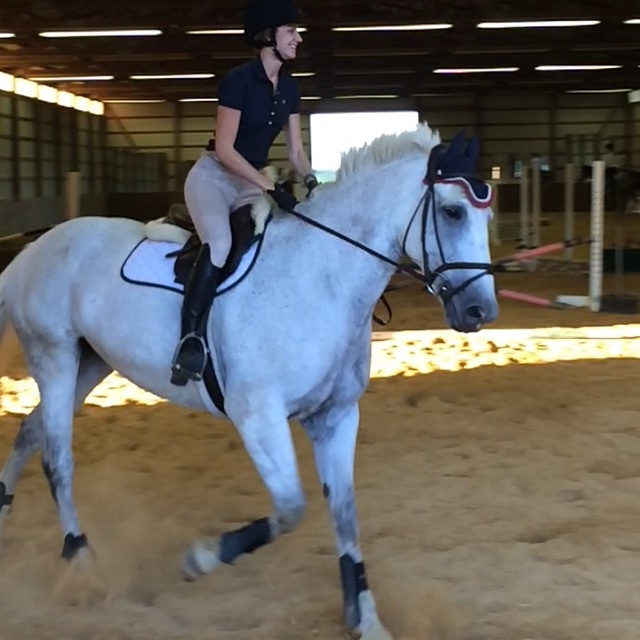 Or when I asked for a downwards transition to trot and got the SASSIEST face ever. Get comfortable schooling full courses at 3’3″. Wellllll kinda. We pretty consistently jump this height without a fuss, but I wouldn’t say they’re full courses. We certainly incorporate this height more often, but it’s not super consistent. Jump 3’6″ regularly. Wellllll kinda. We’ve done this once or twice, but again, not consistently. It doesn’t give me heart palpitations the way it used to, so that’s good, right? Compete in the Adult Equitation Medal class at least once. Still on the list! The way a lot of shows around here run, the 3′ hunters are at the beginning of the day and the 3′ medals are at the end so we never want to wait around 8 hours for it to run. It makes zero sense. I’m still trying to make this work. Try a jumper class. We did it!!! It didn’t go that smoothly, but it was tons of fun and I can’t wait to keep playing in that ring. Make it to an “A” horse show. This is still a rather tentative goal. 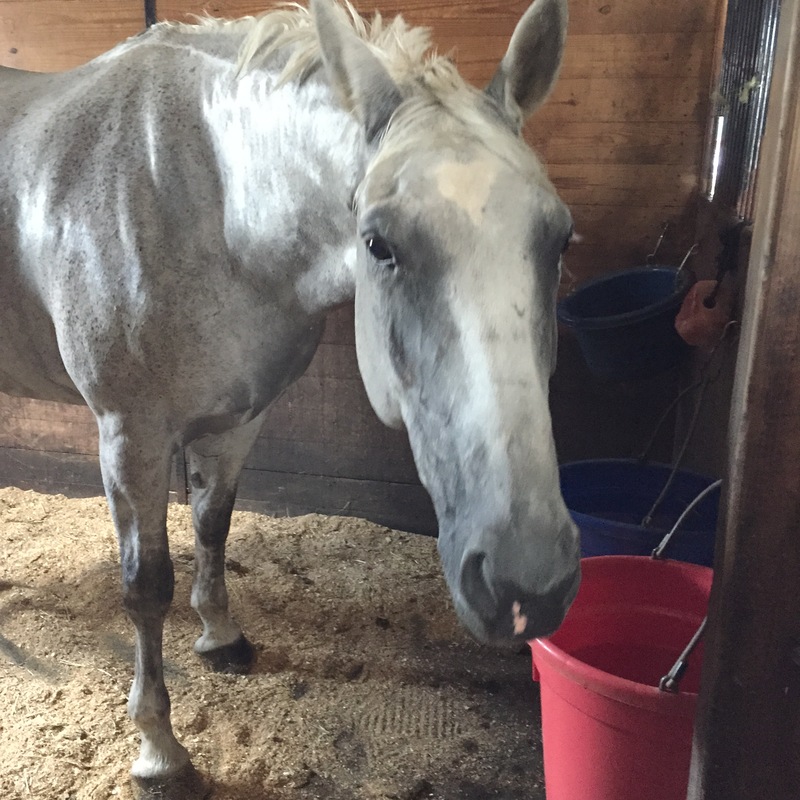 Trainer is hoping I can maybe join the barn when they go to HITS Culpeper in August or September, but this depends a lot on timing and if I can save up enough in the meantime. Keep your fingers crossed for me! 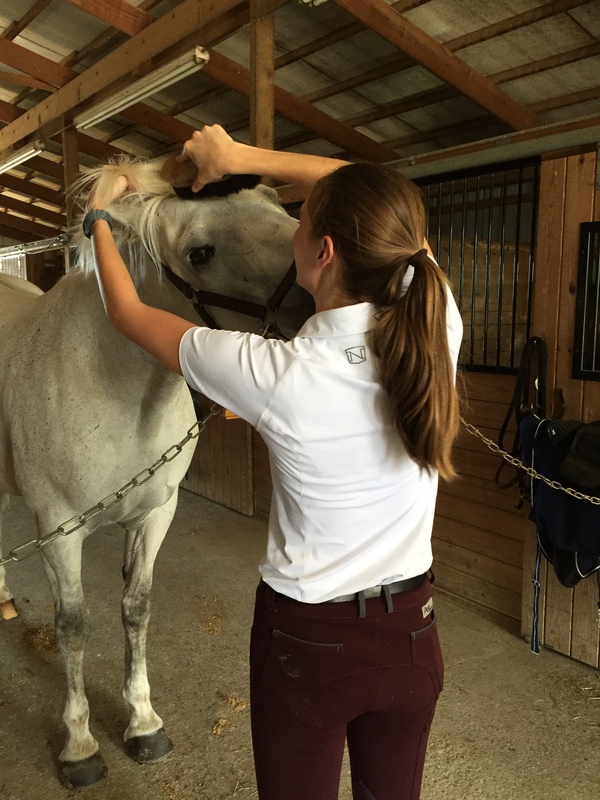 Learn how to braid manes and tails. I’ve been getting better at this- my tail braids are pretty consistently nice. I have yet to conquer the mane braids, but I will triumph! Live through a lesson without stirrups. Getting closer! I actually feel more secure in my new boots, and going around without stirrups is slowly getting less painful. 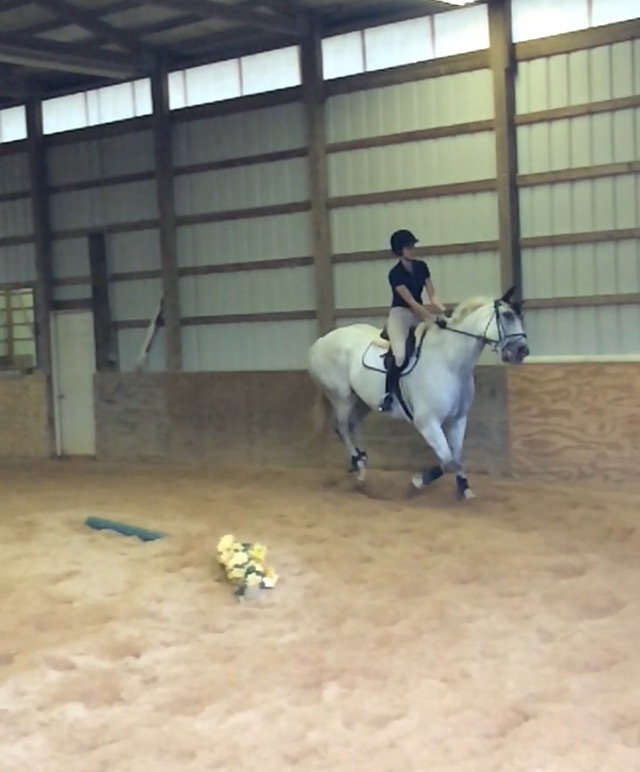 We’ve been doing solid chunks of our warmup sans stirrups, and I even drop them to jump on occasion. Go on at least one trail ride. Totally done!!!! I’ve gotten to go with Courtney from Vintage Virginia not once, but TWO amazing times. I’ve also taken Addy out briefly on some of the bridle trails near the barn and managed to canter on a golf course that I’m TOTALLY allowed to be riding on. It still makes me a little nervous, but I’m definitely conquering that fear little by little. Keep my confidence up. This will never not be a goal, and it’s going really well lately. I want to compete in the Jr/AO Low Jumpers. This won’t happen this year, won’t happen next year, probably not even the year after that, but I want to make it to the 1.20-1.30m level. There’s all sorts of things that need to happen for me to get there (a couple big ones are me learning how to ride properly and getting my hands on a Jr/AO horse in my budget, so nothing too difficult, right?!) but that’s my big goal to work towards. Time to buckle down and get to it! So I realized that I didn’t give a lesson review last week (I was busy hopping on a plane to RI and it got lost amidst the many festivities happening). I’ll briefly say that we did some fairly simple courses with a couple tough turns, and that Addy was a very good girl. 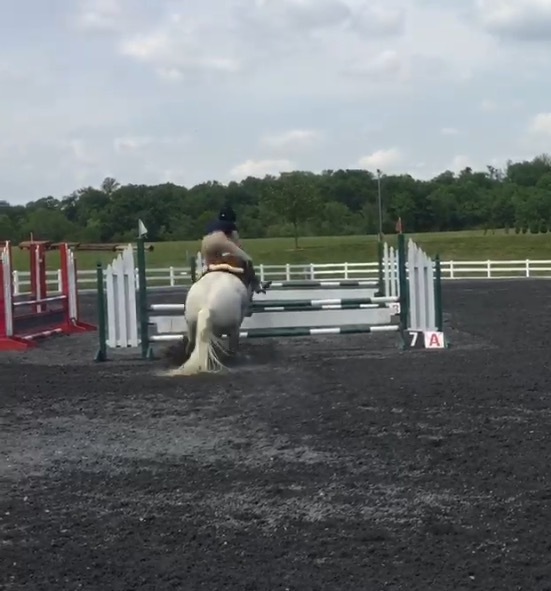 Extremely heavy and barreling around without listening very carefully (we almost ran over my trainer because Addy disagreed with what jump we should be heading to), but she was honest and jumped everything from all sorts of angles. On to this week! First of all, I got myself some fancypants and a new bonnet for Addy, so I was pretty psyched about looking cool. I’m a big fan of “dressing up” a little bit for lessons, I always feel like I ride better when I’ve put effort into my appearance. Not too shabby, eh? I promise I’ll show you Beastly’s face soon too. Once I was fully satisfied in how cool we looked, I hopped on and started warming up. Addy was good for this- she just got new shoes so I was feeling much better about the state of her feet. They’re just growing so fast these days! All that green grass. Our warmup was nothing special, just WTC with some extensions and collections. Addy was nice and quiet for this. We warmed up over 3 as a crossrail a couple times, and Addy realized that OMG IT’S TIME TO JUMP THIS IS SO EXCITING I’VE NEVER DONE THIS BEFORE EVAR. Much excitement. Our consistent note from Trainer was that “there’s one more step in there, hold to the base,” which was definitely a struggle. Homegirl was launching from downtown. But we did get a couple nice ones in there. I even smiled about it. Check out her awesome new bonnet! We then slowly built up the gymnastic. At first, it was just the first crossrail and the other two were ground poles set at one stride each. 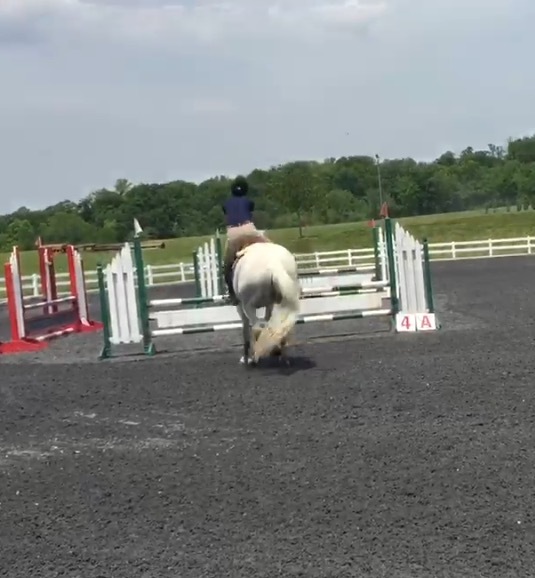 Addy being a snorty unicorn, decided that she would gazelle-leap over the crossrail, bounce over the next ground pole instead of cantering a stride, and then leap the final ground pole. Because, you know, that felt right. I did eventually get her to trot in marginally more quietly and put the correct striding in. Then the second jump went up to a vertical and we did that a couple times, and then finally put the final jump to a crossrail. That first one-stride was set very short and we kept coming up on it too hard, so my big focus was getting a super slow backwards trot to the first fence. This was kinda hit-or-miss, but it did get better over the course of the lesson. We then put the last jump up to a nice wide oxer (I know the diagram is backwards, so sue me) and continued through that way a couple times. Once she was going through the grid in a more civilized manner, I shifted my focus to staying straight down to the end of the ring so that we didn’t cut in our turn. This was put to the test by the following: up the grid (1A-1B-1C), then turn right at the end and do a circle down at that end of the ring, then come down the outside vertical (2), then come back to a trot and go back up the grid, turn left, circle, and come down the other outside vertical (3). By this point we had the grid pretty much down, but adding the outside verticals just stoked Addy’s internal fire. Her zest. Her zeal. Her pep. We came up through the grid nicely, got a surprisingly decent canter circle, then came to a nice quiet distance to 2. And then GOT REALLY EXCITED LET’S GO WHY ARE YOU TELLING ME TO TROT WOMAN. I sure as hell made her trot into the grid, but we were veering all over like a drunken sailor. Canter circle to the left was a little less pretty and we ended up galloping up to a longish distance to 3. We then proceeded to prance around the ring like a carousel horse instead of sitting quietly and waiting our next turn. If you look closely, you can see actual flames shooting out of her nose and a glint of madness in her eyes. But we tried again- got back to trot a little more sedately after the outside vertical, held the canter a little more nicely in both directions, and fit that last step in to the last vertical. It wasn’t pretty, but homegirl needs to learn to love the base instead of blasting through my aids and picking her own distance. I was very happy to end on that good note of her listening to me. All in all, not a great lesson. I didn’t really bring my A game, and Addy wasn’t inclined to be charitable. Nothing particularly bad or dangerous in any way, just not super rideable. I’m thinking that I may start using the Pelham more consistently if we’ll be jumping; it’ll be harder for her to lean on that and drag me around. 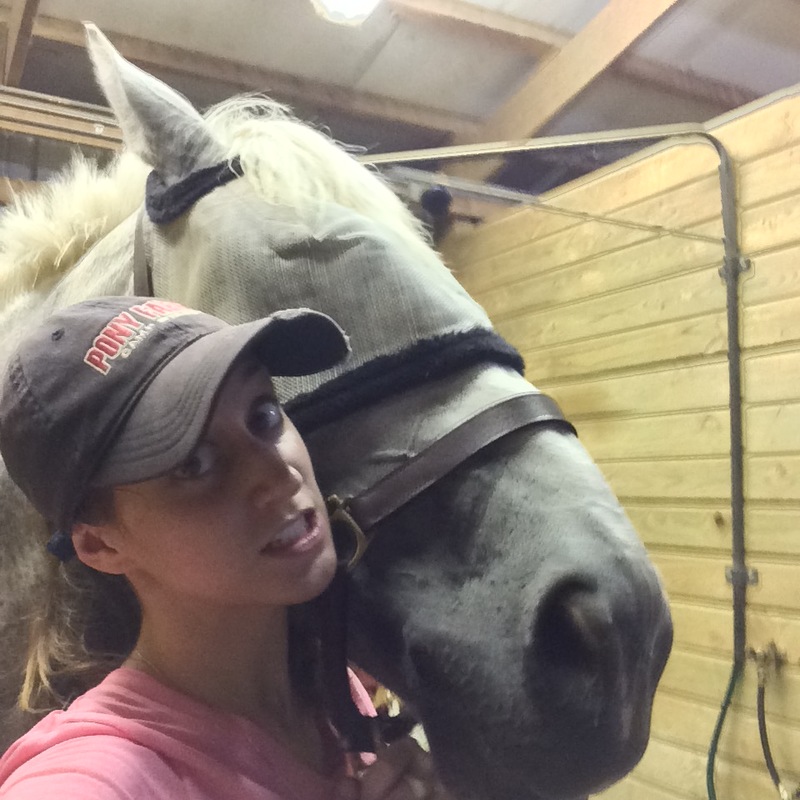 That being said- while this has been my worst lesson in a while, we still managed to hop around all the jumps the way we were supposed to, we were safe, and I still had those moments of joy in the air with my girl. I’m extremely lucky that this counts as a “bad” lesson for me. What happened in your last “bad” lesson and how did you work through it? A thousand apologies for my recent radio silence- my brother got married this past weekend so I’ve been traveling a bunch for that and then spending several days recovering. Check out #kelleygetsacarr on Insta if you wanna see a beautiful wedding!!! I should be returning to my regularly scheduled programming as of now. Can’t wait to catch up with all of you!